Infinite Photography Pro is a simple and clean theme with a great elegant design is easy to customize with Customization Options. This theme is specially designed for photo blogging, photo sharing and well suited for travel, food, life style, sports etc. A translation ready theme with major browser compatible. Infinite Photography Pro is responsive theme which is compatible with all types of devices. Whole site color can be changed with a single click. Replaceable logo, Multiple layout of Home page and Category page, Social icons integrated, own copyright text, multiple color options, font family options and many more. A SEO friendly theme with WooCommerce compatible. Site layout has different options like Right sidebar, Left Sidebar, Both sidebar, No sidebar and Middle column. You can make your site with photography layout, masonry layout and Normal Layout too. Download Infinite Photography Pro theme from Acme Themes on your desktop or other specified folder. Click on Uploads and browse the infinite-photography-pro.zip from the desktop or other specified folder you have downloaded it. Download Infinite Photography Pro theme from Acme Themes on your desktop or other specified folder. Unzip infinite-photography-pro.zip to your Desktop on other specified folder. Using an FTP client to access your host web server. Go to /wp-content/themes/ and make sure that you do not already have a infinite-photography-pro folder installed there. If already installed there, then back it up and remove it from /wp-content/themes/ before uploading your copy of Infinite Photography Pro theme. How to manage Site Title and Identity ? Write the site title and tagline on the respected field. How to add “Logo” on the theme ? How to manage menu on the theme? Click on Add a Menu and set the menus there. How to add Widgets on Sidebars ? Set the available widgets for the specific sidebars. You will find all the available options for sidebar there. How to manage Featured section ? Featured section include slider and static image. You can use Slider or Static image. You will find the available options of featured section including slider and static image there. How to enable Slider on theme ? You can easily enable the slider on the featured section. You can manage slider from Page, Post, Category and Custom Slide too. 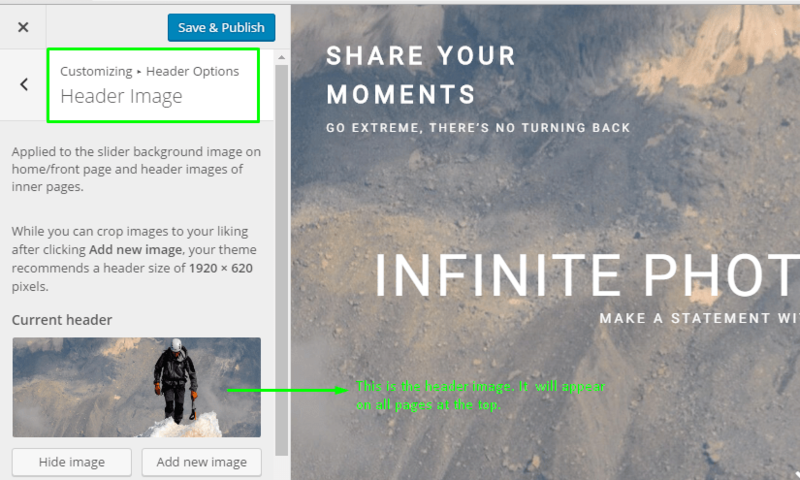 In case of Page, Post and Category slider image will be featured image but in custom slide, you can set your own image, link, text on the slide. After enabling featured section from Slider you will get Featured Section Option > Featured Slider Options to manage more on the slider. You will get all the options related to slider are here. Please have a look on below screenshot for more information. How to manage Header Options ? You can manage the menu, search icon and Header image from this section. Checked to Enable Sticky Menu to enable it and unchecked to disable it. Checked to Show Search on Menu to enable it and unchecked to disable it. You can easily add/change header image from the customize. If header image is not set, default image will available as a header image. How to manage footer section ? 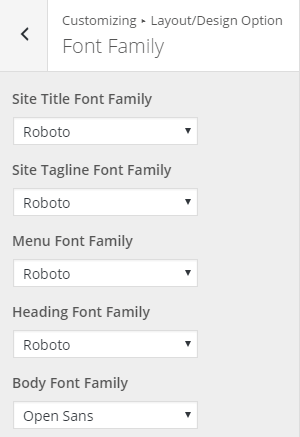 You can easily manage footer section from Appearance > Customize > Footer Options. You will get all the options related footer section there. Enter the URL of the social media link on the respected icons. Checked on Enable Social to enable it. You can manage footer copyright text, powered by text, go to top options, and number of sidebars on footer. How to Manage Layout/Design of theme ? This theme includes multiple options for site layout. You can set the different layout for individual pages as well as can set the global layout too. In the layout/design, you will get lots of options to manage the site. You will get the multiple section to manage it. Before the site load, intro loader will visible on the site. 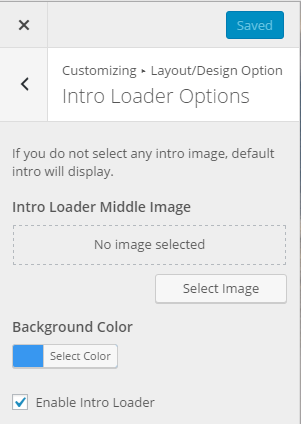 You can set your own image, color with enable/disable options for the intro loader. Set the default sidebar layout from here. While creating new page or post, default sidebar will set there. 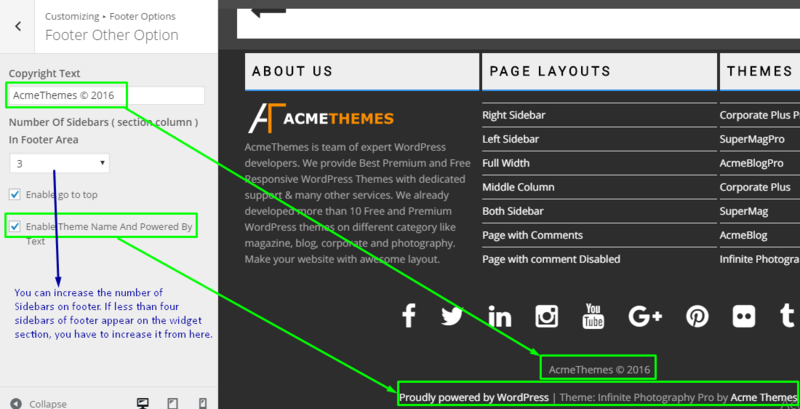 You can easily override the sidebar for the page and post from the respected page. Select the sidebar from the dropdown. You can change the layout of Home page on different layout. Please see the below screenshot how home page will look after enabling the different sidebar layout. As the above on the Home/Front Page, you can easily manage the sidebars on the Archive Page and Category page. In this section, you can easily manage the front page and blog page layout on Masonry, Photography and Normal Layout. Beside this you can easily Show/Hide Camera icons, Increase or decrease the column number on blog page and archive page as well as exclude certain category on Blog Page too. In this layout, the height and width of all the images will same on Home page and Blog page. If you like this layout, you have to follow the below guideline. 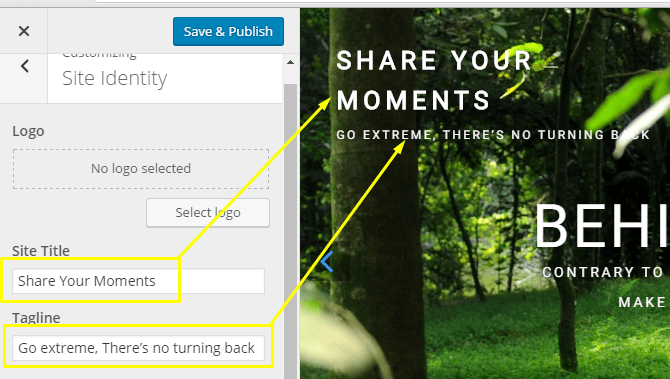 Select Photography on Default Blog Layout dropdown. As the above steps, you can change the layout to Normal layout. Select Normal on Default Blog Layout dropdown. 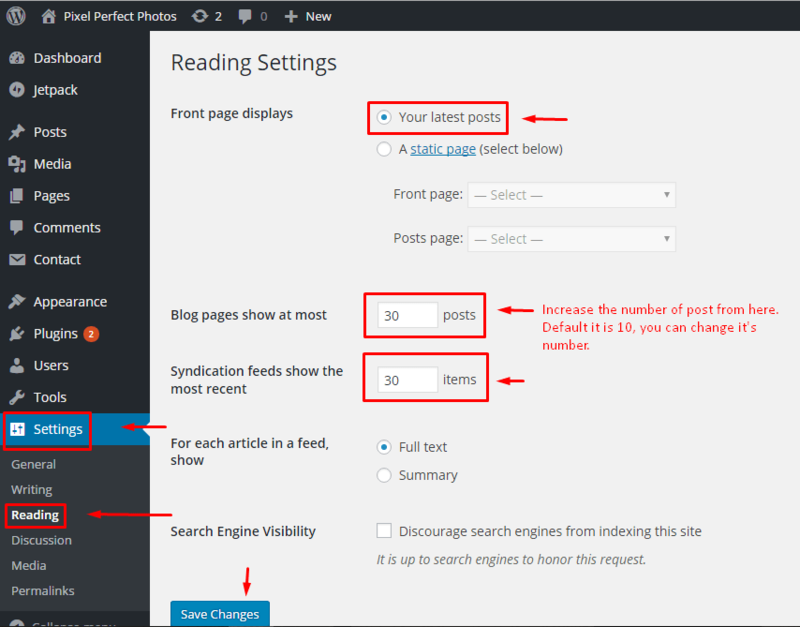 You can easily change the number of Post Column on Home page and blog page. Default column is set to three, but you can choose from 1-4 column layout. 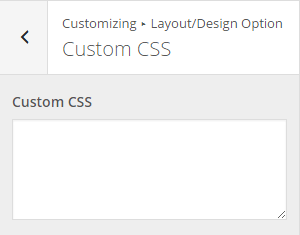 You can change the overall color of the site from the available color options. In basic color options you can change the color of, Background, Site Title, Site Tagline, Primary Color, Paragraph Color, Heading Colors etc. Advanced color options help you to change the color of site with multiple color options available there. This theme include more than 100 fonts family and can change the font of every section like Title, Tagline, body paragraph, heading tags etc. Select the Image for your background. 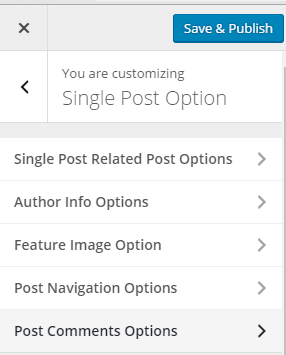 How to manage Single Post Options ? It’s easy to manage the every element of single post. 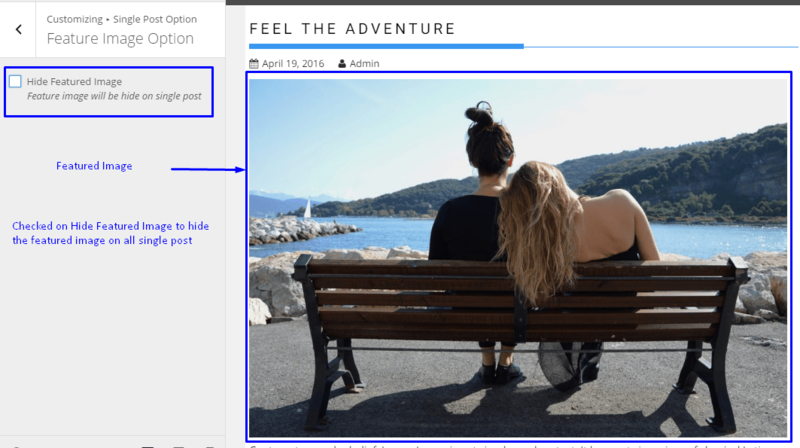 You can manage related post, author description, navigation, featured image options as well as comment options. Checked to Show Related Posts In Single Post to enable related post on single page. Give the title of the related post. Select the Column and number of related posts. How to hide featured image on single post? How to change the layout of Navigation ? You can easily change the layout of navigation on single post. Available options are: Disable, Default , Title and Image and Image. Select Disable to disable navigation on single post. Manage the comment section on the single post here. Theme options include more options to manage the site. 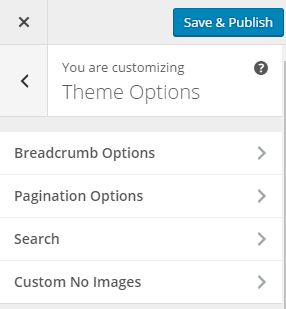 It includes Breadcrumb, Pagination options, Search options and Custom No Images. How to manage breadcrumb options? You can manage the site breadcrumb from this section. You can also enable/disable breadcrumb from here. Select Disable if you want to disable the breadcrumb. How to change search Placeholder ? How to change Custom No Images ? 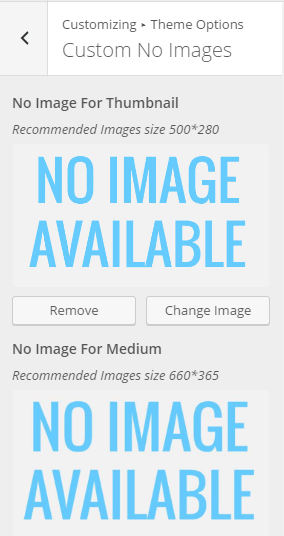 If you missed to add featured image on a post, default no image available will appear there. 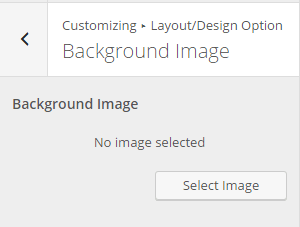 You can set your own custom images for default no image available. How to reset the settings on default ? If you want to restore the settings on default, please follow the below method. Restore the setting with the options.